Small businesses, just like homes, also need cleaning and decluttering to become organized. Getting rid of unnecessary physical, virtual, as well as mental clutter will greatly benefit you and your business. You and your staff will be able to work more effectively and productively by decluttering. Consequently, this would lead to business profitability and growth. A new year has just started, making now a perfect time to declutter your small business. It may seem like a daunting and challenging task, but with the following tips, decluttering could be easy and something you’ll look forward to doing. You need to dedicate a portion of your precious time to declutter your small business. Check your schedule and set aside a few hours per week for your decluttering efforts. This also pertains to fixing your schedule. Identify the tasks you can delegate to your staff and other activities that you think only waste your time and should eliminate. This way, you’ll have more time for things that will help you and your business grow. Researches have shown that a clean workspace helps boost productivity. Therefore, it is important that you keep your workspace or overall work environment clean if you want your business to be more productive. Get rid of physical junk, like scratch papers, unnecessary receipts, and other things that just take up space on your desk. Going paperless is a great way to declutter your small business. Start digitizing your files and receipts by using platforms like the Cloud and other apps that you can easily download and use. This strategy not only keeps your files in order, but it also helps streamline your workflow. Seeing thousands of emails in your computer can be overwhelming and stressful. 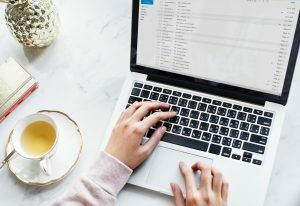 Not all of them are important to your business, so it’s best to start decluttering your inbox. You can hire a virtual assistant to help you manage your emails. Ask her to delete spam emails, categorize the important emails, and even manage your subscriptions. With a good email software, this task should be easier for your VA to accomplish. Working on your computer will be much easier and efficient if you have an uncluttered desktop. Save your files on different folders with clear and appropriate names, remove the apps that you don’t use, and create shortcuts for programs that you use regularly to make them more accessible. Evaluate your target market and existing customer base. As much as you’d want to work with as many people as possible, there are those that won’t turn into real clients. Declutter your contact and email lists so you can focus on serving your ideal clients better. A customer relationship management software will come in handy not only for managing your customer lists, but also for managing sales well to avoid clutter. Clutter in small businesses comes in different forms. But whether it’s in the form of piles of paper on your desk, tons of junk email messages, unnecessary apps, and others, it has a huge impact on your business’ productivity and profitability. Consider the tips mentioned and start decluttering your small business to have a clearer path to success this year. Our virtual assistants can help you declutter your small business! Contact us to find out how we can work together.